Front rise: 10.5". isneam: 26.75". AG ADRIANO GOLDSCHMIED Jodi Crop Slim Flare High Rise Mom Jeans Distressed 27R. Condition is Pre-owned, very good. Please see photos for details. Shipped with USPS Priority Mail. Measurements: Waist 29.5 Inseam 26.5 Rise 9.5 Cuff 15.5 Ships from a smoke free and pet free environment. Great jeans, very good condition. Material content is in photos. Inseam: 26. Size : 29R. AG ADRIANO GOLDSCHMIED. Up for sale beautiful jeans by. Any r eturn s without prior approval will not be honored. • Light wash. • 15.5" waist laying flat. 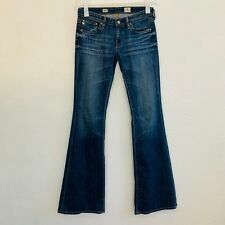 AG Adriano Goldschmied “The Club” - Women’s Flare Jeans Size: 30 Color: Dark Wash Measurements (laid flat): 41” length, 32” inseam, 9” rise, 15” waist, 17.5” hip Pima Cotton Blend Item has been kept in a smoke free home with cats but no dogs. Please feel free to ask for additional measurements if needed. Colors may vary slightly due to lighting and computer. Inseam: 34". These jeans are in Great Condition! Front Rise: 8". Leg Width at Hem- 9". Inseam - 33" ---. Waist - 28" ---. Thigh - 17" ---. AG Adriano Goldschmied. The Jodi High-Rise Cropped Flare Jeans from Anthropologie. USA Size 27: Waist 14.5" one side, Front Rise 9.5", Back Rise 12", inseam 26.5". Distressed denim jeans. Slim, cropped fit Five-pocket styling. 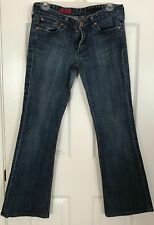 Authentic AG Adriano Goldschmied The Janis Jeans Size 28 High-Rise Flare New with tags. AG Adriano Goldschmied belle flare jeans. Cotton stretch. Inseam 31.5'. They are Style Legend with Low Rise and Flare! They are in Very Good Condition. Zipper Fly 98% Cotton 2% Lycra. A high-waisted silhouette with a slim fit through the knee and a wide, flared hem. Across Knee Opening: 8”. Front Rise: 11”. Sizing Issues are not considered Not As Described. Wash-Lazy Blue. I am human and may have made a mistake, which is why I would like to be able to fix it for you. AG Jodi High-Rise, Slim Flare Crop Jeans. Rise: 9.5". Inseam: 26". Adriano Goldschmied Women’s Belle Flare Jeans Size 29 regular Item is in excellent condition, no flaws No stains, no wear on leg openings Lowrise Stretch Flare Lightwash Distressed Cotton blend Made in U.S.A. Actual measurements taken with item laid flat Waist: 31” Rise: 8” Hips: 36” Inseam: 32” Leg opening: 22” If you have any questions about this item, feel free to ask! Size: 30 R. Pre-owned Condition. Had distressing at hem. Has a spot on the knee area. Condition - Great Pre-owned Condition. Gently Worn. Light Wash Wear. Pulled/Missing Thread On Back Pocket Embroidery. Style - The Legend Flare Leg / Style #: RGL1026. Leg Opening - 9.75". Details - Stretchy. 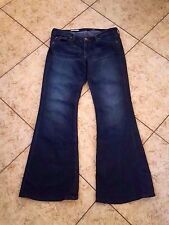 AG ADRIANO GOLDSCHMIED Club Jeans Low Flare Dark Distressed Sz 27 NEW. Made in the USA. STYLE : The Club-low rise flare. They are in mint unworn condition with no issues. Factory applied distressing as listed above. Slender fit, High rise, opening into a subtle flare cropped at the ankle. 5 pocket style, belt looped waistband, AG logo patch on the pocket and on the back of the waistband, fabric contains 98% COTTON 2% POLYURETHANE. HAS MAGIC SLIDE BUTTON. Rise - 8.5. MATERIAL -100% COTTON. CUT #PO#AG-5158. STYLE #GAT1013-FUS. Thigh - 11. Hip - 21.5. Waist - 16.5. These flare jeans feature 5-pocket styling and a single-button closure. Contrast stitching at back pockets. Wrinkling and whiskering at front. Worn edges and moderate distressing. 22" leg opening. XSSML004681223 in.24 in.25 in.26 in.27 in.28 in.29 in.30 in.31 in.32 in.33 in. 26P25 in.26 in.27 in.28 in.29 in.31 in. S525 in.27 in.28 in.29 in.30 in.